Pretty good acting by Amir Khan. There's always a bit of Amir in every role he does, and there's a bit of the Amir from 'Satyamev Jayate' here as well - but overall he has done a great job portraying the always bewildered man-child that PK is supposed to be. Also, was it a hat-tip to Bhuvan from Lagaan when he says "sarat manjoor hai"? This could have been solved by not falling for the trope of a necessary love story for the female lead (and to some extent the male lead). I don't think subtlety is something Raj Kumar Hirani (or Vinod Chopra or Amir Khan for that matter) doesn't get, I don't think he was going for subtlety here. Also, he has enough satire here for those of us looking for subtlety. Raj Kumar Hirani has been consistent with his formula, and it has mostly worked. But he's at a stage (or been there for a while) where we expect much more from him. He does have a knack for picking catchy key-phrases though (Jadu ki Jhappi, Gandhigiri, All is Well, and now, Wrong Number). I like how Hirani uses his songs to advance the story, for the most part. The song 'Love is a Bhest of Time', though picturized well, is a bit jarring to the narrative. In general, I like the picturization of songs in Hirani's movies. Though it is a comedy/satire with a big-name star, this is in no way a 'safe' film given how touchy we are about religion. Kudos to the team for trying to do this. I am sure there will be comparisons to Akshay Kumar's OMG, and the second half does seem quite similar to that movie. How great was it to see Pyare-Laal in a movie after so long? (he was the old guy who bought tickets to the show, if you're wondering). Well, any movie that keeps the audience hooked (everyone in the theatre I watched it in was laughing/exclaiming/silent together), is successful just by virtue of doing that. What the marketing machines try to do now-a-days is to get most people inside the theatre in the opening weekend, PK actually keeps you sitting there. There are part I agree with, and parts I don't. But I think this is a movie you should watch - money well spent. How are you ? Long time since we met spoke. 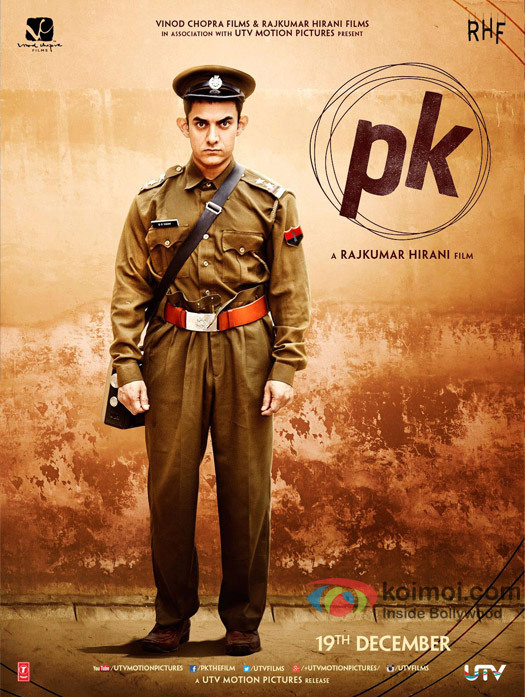 Found PK to be average movie in many ways. Perhaps some of those hidden things you pointed out is lost on me. For some reason this was marked as spam by blogger :/ we've actually talked since you posted this comment.